Saint Alphonsus Health System has filed plans with the City of Boise to build a neighborhood hospital in Downtown Boise, across from St. Luke’s Health System’s support services campus (the former MK/WGI/URS campus). It’s also less than a mile from the original St. Luke’s Regional Medical Center campus. “A neighborhood hospital is a new approach to providing convenient, expedient access to emergency services and short-stay, low-acuity inpatient beds for a local neighborhood,” Saint Alphonsus Public Relations and Digital Strategy Manager Josh Schlaich said. “As a smaller hospital facility with 24/7 emergency access, the neighborhood hospital in downtown will improve access for the community, helping to respond to the increased number of patients (and increased level of acuity) we’re seeing in our current ER at Saint Alphonsus Regional Medical Center on Curtis Road. The 18,215 square foot medical building would be located next to Whole Foods and would feature eight exam rooms, imaging department and room for eight inpatient beds. The two-story building would also include emergency care services, a pediatric exam room, a meditation/bereavement area and conference room. It would also feature an ambulance bay, and would be Saint Alphonsus’ seventh area emergency room. Forty-eight parking spaces would be added to the site. The hospital would replace temporary employee parking for Whole Foods on the site. 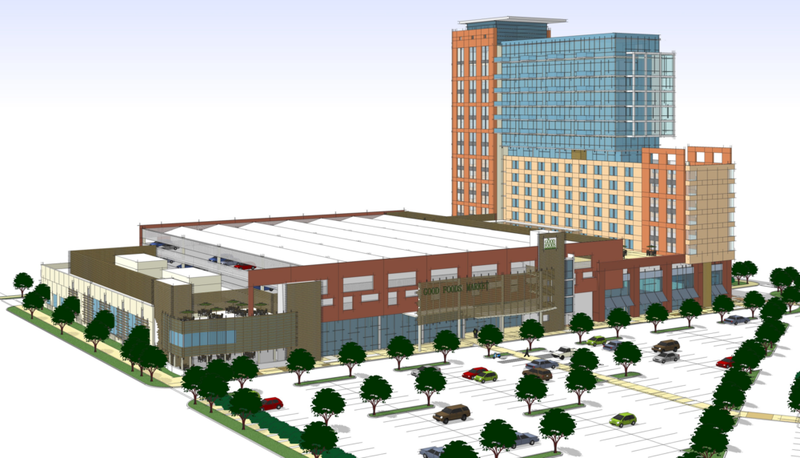 In 2007, City of Boise planning staff had approved a 17-story mixed-use project on the site that would have included a hotel as well as Whole Foods. The 2008 economic downturn scuttled those plans. When the economy began to recover, the existing Walgreens and Whole Foods were built in separate buildings.